The 2012 Bordeaux vintage is beginning to receive the accolades it deserves, it is unquestionably a very good, charming vintage, similar to 2008 and far superior to 2011 and 2013. Furthermore, 2012 on the right bank is quickly developing into one of the best in the last ten years, described by Parker as close behind the extraordinary 2009 and 2010 vintages. The right bank villages of Pomerol and St. Emilion – which are Merlot dominant – could be picked before the rot and deluge issues occurred and to this extent the right bank has produced an excellent vintage, with sweet tannins, ripe fruit and good mouth feel. The 2012s have now been bottled and therefore it is the cheapest physical vintage of Bordeaux in the market; they can be drunk now or enjoyed for twenty years. Moreover, we expect a lot of trading in the lead up to Parker’s bottle scores this summer. In 2012 Chateau Gazin produced something special, which as Robert Parker states is ’probably the first time in the history of this estate that Gazin has been made from 100% Merlot.’ As we often posit, 100% Merlot wines tend to trade at a premium, particularly on the right bank of Bordeaux and especially in the village of Pomerol. In 2012 Gazin is one of the wines of the vintage, with 95 points from James Suckling and 93-95 from Parker. This makes Gazin incredible value for money when compared to other leading Pomerol and St. Emilion wines. The above comes as no surprise as Gazin boasts the soil to make a 100% Merlot wine. Gazin’s 26.5 hectares borders Petrus and L’Evangile, in fact Gazin sold 5.5 hectares to Petrus in 1969. Gazin is cited at the North East section of the Pomerol Plateau and shares one of the highest levels of elevation with Petrus. As such the terroir embodies the best of Pomerol, gravel with clay, iron and sand, it even boasts patches of Blue clay, made famous by Petrus. Gazin is also one of the most venerable estates in Bordeaux, once the Hospital of Pomeyrols, built by the Chevaliers to receive pilgrims on the Santiago de Compostela. As such the logo draws on it close connection with the Knights Templar. 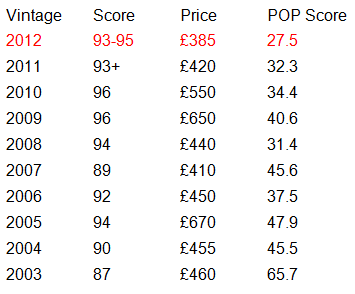 Gazin 2012 is also undervalued when compared to past vintages, with the lowest Price Over Points Score in the last ten years. James Suckling, who shares a similar palate to Parker, re-tasted Gazin 2012 in February this year awarding it 95 points and we expect Parker to follow suit. Suckling’s 95 points puts it on par with his score for the 2009 and 2010, reasserting the excellence of 2012 on the right bank and in particular Gazin. As one can see from the table below, that makes this a strong wine to speculate on in the short term. In years to come Gazin 2012 will become considerably more expensive and certainly a wine to present blind at a wine dinner. We tasted it again recently and believe its ripe tannins, voluptuous mouth-feel and broad structure could fool many into thinking they are tasting the great 100% Merlot from Bordeaux, Petrus! A 100% Bordeaux Merlot wine is rare, rarer still at £32 a bottle in bond or £41 duty and VAT! This is simply stunning at this the price point. This is a gorgeous wine with superb density and balance for the vintage. Full body, polished, fine tannins and a long, long finish. There’s so much complexity and beauty to this with blueberry, wet earth and spice character. Some sliced Chinese mushrooms as well. One of the best wines I have had from here in a long time. Better in 2020.